Pleas for help with PHD Guiding seem to come up more often than almost other long-exposure imaging topic. I make no claims to be the ultimate expert on the subject, but I have travelled some way along the road from guiding failure to success, and so I thought it might be good to share a few pointers I’ve picked up along the way. (By failure I mean I was getting one 1 minute exposure out of every five where the stars were slightly less egg-shaped than the rest. By success I mean I now discard one 10 minute exposure out of every thirty due to a guiding issue). Firstly, I am going to cover the basics of a good guiding set-up, since many problems that are blamed on PHD are actually external issues related to the equipment being used or abused. After that I’ll take a look at how to diagnose and fix guiding problems with PHD. If you are imaging DSOs, you will inevitably be drawn to the idea of guiding in order to be able to make longer exposures. That said, if you aren’t ready to invest in a guiding rig yet, you certainly can improve your exposure length by better polar alignment and by using Periodic Error Correction (PEC) if your mount supports it. Eventually you will reach the limits of what is possible, or more likely the limits of your patience due to the amount of effort required before you can start imaging. Personally, I skipped the middle bits and went straight to guiding! Polar alignment of my NEQ6 mount consists of putting the tripod on some painted marks on the patio and spending five minutes using EQMOD and the polar scope to do a rough alignment. I don’t drift align and I don’t use PEC; I rely on my guiding rig entirely. As we will discover, the longer the effective focal length of your imaging scope, the more likely it is you will also need to get good polar alignment, to use PEC as well as guiding, or drop five or ten grand on a new mount! That said, using a short focal length scope on a decent mount and with an effective guider makes the mysteries of polar alignment and PEC a lot less important when starting out. Do I Really need Two Cameras? You cannot image and guide at the same time using one camera. The guide camera image needs to be read-out every few seconds to spot when guiding corrections are needed. The imaging camera needs to take a long exposure, and reading out the image ends that exposure, so you can’t do both at once! The only exceptions are self-guiding cameras, which consist of two cameras in one housing (see below), and some old cameras where one set of pixels was read out for guiding and another set used for imaging. The latter type wasn’t particularly successful and I don’t think you can get them any more. There are many cameras on the market that can be used for guiding. Many people start by experimenting with webcams. These can work if your guide scope has a particularly fast focal ratio, but the lack of a long-exposure feature usually means you will be looking for a proper guide camera fairly quickly. Alternatively you can buy a dedicated mono guide camera for between £100 and £150; keep an eye on the second hand market as these come up for sale regularly. The final option is an auto guider, which tend to be more expensive than the cameras above. The advantage of an auto guider is that you do not need a laptop to guide; all the brains are built into the camera and guiding commands are sent via the ST4 port to the mount without a computer involved**. I haven’t used an auto guider but reports of their success tend to be mixed; either they work or they don’t, and if they don’t it can be hard to diagnose the issue. On the plus side, most auto guiders can also be used as a ‘dumb’ guide camera in conjunction with PHD or other software. ** Note that not all cameras with a built in ST4 port have auto-guiding capabilities, so check the specifications. 1. Using a separate guide-scope and guide camera. A second, cheap telescope or finder and a cheap(ish) guide camera is mounted piggyback on top of the imaging scope, or side-by-side using a dual bar. Pros: Relatively cheap to purchase. Quick and easy to set up and use. Two telescopes on one mount looks really cool, like some kind of awesome space cannon. Cons: Flexure, mirror shift, flexure and flexure. When to use: On lower end mounts like the HEQ5, NEQ6 and cousins, a separate guide scope works best with shorter-focal length scopes. 2. Using an off-axis guider (OAG). An OAG sits between the focuser and the imaging camera. It uses a small prism to deflect part of the incoming light into the guide camera. Pros: Relatively cheap to purchase. Much less weight on the mount as there is no second scope. Reduces problems with flexure and mirror shift. Cons: Some people swear by OAGs, others swear at them. They have a reputation for being fiddly to set up and use for beginners, as you must get both the main camera and the guide camera parfocal and also locate a suitable guide star by moving and rotating the prism. When to use: A better option for long focal length scopes, and a much better option for moving-mirror scopes like SCTs. 3. Using a self-guiding imaging camera. A camera with a main imaging sensor, and a second (smaller) guiding sensor next to it. Pros: Much less weight on the mount as there is no second scope. Reduces problems with flexure and mirror shift. Much easier to set up than an OAG. Cons: Only a few higher end (expensive!) CCD cameras available. On many models, the guide sensor is behind the filter wheel. Shooting through a filter (especially narrowband) often necessitates much longer guiding exposures to get a good star and may result in less accurate guiding. There are a few newer models that place the guide chip in front of an integrated filter wheel. Exposures Deeper than your Pockets? If you are just starting out in deep-sky imaging, it is important to realise than long-focal length imaging is hard on low-end mounts. Very hard. Don’t be fooled by all those glossy adverts in the magazines, anything in the sub £2,000 bracket is definitely low-end. Don’t take that remark the wrong way! Mass-market GOTO mounts have made deep-sky imaging accessible to us mere mortals, but understanding the capabilities and limitations of your equipment is key to success in this game. The first tip is to learn your craft using a short focal-length, fast f-ratio scope. Guiding is much easier, and you’ll get better results with shorter exposures (a virtuous circle). Aim for a focal length of no more than 800mm and an f-ratio of no more than f/6 (and if you have the budget to get to f/5 or f/4 with decent optics, so much the better). – 2,000mm is probably approaching (if not beyond) the limit of what an NEQ6 can track in the hands of an expert imager with years of experience. In the hands of a beginner like me, results were frustratingly poor and I wasted many nights getting nowhere fast. – f/10 is very slow for DSO imaging, necessitating long exposures. But long exposures were not possible (see above). A vicious circle not a virtuous one. All mounts will quote a maximum weight that they can carry. Firstly, check whether the quoted weight is just that of the scope and other equipment or whether it also includes the counterweights (which has been the case in some more dubious marketing materials). The next tip is that once you know the maximum equipment carrying weight of your mount, divide it in half. That is the target weight for all of your imaging equipment; the imaging scope, guide scope, cameras, dovetail bars, scope rings and anything else you want to hang off the mount. You will be much more likely to succeed with grossly over mounted equipment than you will with a mount that is struggling at close to its maximum carrying capacity. I know the feeling well, “If I buy the HEQ5 instead of the NEQ6 I can spend the extra money on a bigger scope..” Bad decision. Buy the big mount and the small scope; if you’re serious about imaging there will always be another scope along later! Managing weight is always a compromise. Finder-guiders are cheap and lightweight but may have too short a focal length for your imaging scope (see below). Losmandy-style dovetail plates and solid tube-rings add weight, but lightweight alternatives may make it hard to avoid flexure (again see below). You will find it helpful to weigh your components or check the specifications of any potential purchases and keep a running tally of the total. In order to have the best chance of guiding successfully, you need to match your guide scope/camera to your imaging scope/camera. Now I know you may have read some received wisdom that when using PHD Guiding you don’t need to worry about matching the guider and imager; that is true but only up to a point. 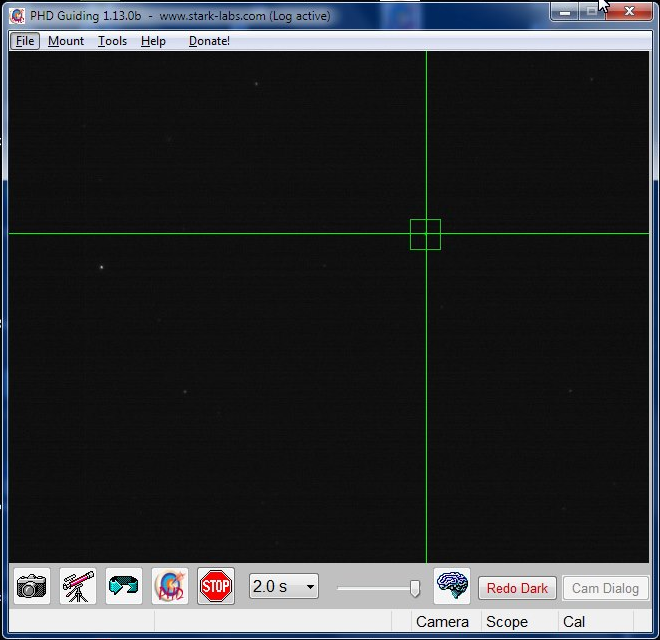 The next tip is to is to match the pixel scales of the guider and imager. By ‘pixel scale’ I mean the angular resolving power of the scope/camera combination in arcseconds**. PHD Guiding can track the centroid (centre point) of a guide star to ‘sub pixel accuracy’. Basically it is able to calculate the position of the guide star down to a fraction of a camera pixel. This leads people to the erroneous conclusion that they don’t need to worry about matching pixel scales of guider and imager because PHD can “track to a 10th of a pixel” or even “a 50th of a pixel” (depending on who you ask). In theory that is true, but in practice you are not likely to get PHD guiding reliably to more than one quarter of a camera pixel. So a good rule of thumb is your imaging pixel scale should be no more than four times your guiding pixel scale. You might be able to exceed 4x by some margin, but sticking to less than that will make your life much easier. So how do you calculate your pixel scale? If you don’t feel like doing the maths, use my Imaging Toolbox to do the hard work for you. The upshot is that I my imaging resolution is about one and a half times my guiding resolution (2.67 / 1.9 = 1.41). That is well within the 4 x rule we established above. Don’t forget, you can use a Barlow lens or a focal reducer to adjust the relative pixel scales of imager and guider. For example, the quality of the image through the guider is not critical so a cheap Barlow can be used cut the number of arcseconds per pixel if needed. Now there is a lot more that could be said about the optimal pixel size of imaging cameras vs different scopes, but that is another topic. The best advice I have read is that your first priority is to have a scope and camera combination that can fit your target in the frame, and to worry about everything else later! Again using the Imaging Toolbox you can try different combinations of scope and camera to see what works. ** One arcsecond is 1/3600th of a degree, which is a pretty small angle. – The guiding rig and the imaging rig are not joined together in a mechanically sound way. As the mount moves to track the sky, gravity or cables pull on one part more than the other and they end up pointing in different directions. Usually this is simply a matter of loose mechanical connections between the two scopes allowing them to bend or twist out of alignment. – Parts of one of the rigs move, causing the image to shift. The two most common causes of this are the mirror shifting or flopping in SCTs (and other moving mirror scopes), or a drooping focuser tube which bends under gravity. Technically these are not ‘Differential Flexure’ but the net effects are the same, as are the solutions. The fundamental problem is that PHD will be successfully keeping the guide star in one spot on your guide image, but because the guide scope image is moving relative to the main scope image, the main image ends up trailing. If you are using an SCT or similar scope, an OAG or self-guiding camera is the surest way to address this problem. As the mirror flops under gravity, the guider sees the image shifting in exactly the same way as the imager does and compensates for it. If you are using a piggy-back or side-by-side guide scope, you may find that you get good results when the scope is pointing in one direction, but not in another. This is often a sign of mechanical flexure of some sort, as the effect of gravity causes things to bend more in some orientations than others. – The biggest culprit is adjustable three-point guide-scope rings (like a set of giant finder-rings). The ones with plastic screws are an absolute disaster, and even the plastic-tipped metal screw variety can cause problems. Avoid at all costs and use a set of solid scope rings for your guide scope: We’ve all got a set of three-pointers in the bottom of the junk box having learned the hard way! – If you are using a finder-guider, try to use a pair of solid rings. Avoid three-point finder rings if possible (especially plastic screws), and never use a the rubber o-ring type of finder holder that you get on many cheap scopes! – Check for cable snags or pulls. It is tempting to leave a nice long loop of cable from the cameras to the computer to avoid it snagging on the mount, but the weight of the cables can be enough to cause flexure. The best solution is to run the cables from the cameras up the scope tube to the midpoint of the scope without leaving a big loop, fix them there with Velcro or a tie and then run back to the computer from that point. – After that you will need to look at the connections between mechanical components for signs of flexure. If you can hold the imaging scope in one hand, the guide scope in the other and make them move visibly by applying gentle to moderate force, you may well have an issue! Even if things look solid, it only takes a few arcseconds of flexure to ruin an exposure, and the amount of movement between the scopes needed to cause that is imperceptible to the human eye. Tighten up bolts (but beware of over-tightening and stripping threads), file any contact surfaces flat, add shims, washers, extra bolts, screws and brackets as needed to keep everything rock solid. – Check your focusers for droop. The focus tube will be pulled downwards under gravity and as the scope rotates it can cause the guide image or the main image to shift. Make sure your focuser tensioning screws are properly adjusted; you should be able to point the scope straight up and not have the weight of the camera cause it to slip. Also apply the lock screw as part of the focusing process if you have one. Using it can cause the focus to shift in cheaper models, but it will reduce the tendency to droop or slip, so learn where to set the focus point to allow for this final shift. Ultimately you may need to fit an upgraded focuser if you have a heavy camera. – Aim the telescope at a group of bright stars about 40 or 50 degrees above the horizon and take a short exposure of a few seconds, long enough to capture the stars but short enough that you would not get trailing due to poor tracking. Look at the image and see if all the stars are elongated in the same direction. If so, it is likely that you have non-orthogonality. – Now rotate the camera through 90 degrees with respect to the telescope and take a second short image. Figure out which direction is ‘down’ towards the ground in each of your pair of images. If the elongation in both images is in the up/down direction, then you most likely have a problem with the focuser or other element drooping under gravity. – If the direction of elongation changes as you rotate the camera, then you probably have a mechanical problem in the imaging train. Very occasionally the problem can be with the camera sensor not being parallel to the mounting ring on the camera body, but it is more likely that something is cross-threaded or not fully screwed together. I recently had a problem with a retaining ring in a light pollution filter that was not fully screwed in and this caused the camera to about 0.5mm off true. The next tip is to obtain a set of digital callipers. These are invaluable in checking orthogonality of the various elements in the imaging train, as it can be pretty hard to spot small misalignments by eye. Use them to measure the gaps between the same points all the way around the focus tube or other element to ensure that it is the same. As a bonus, you can use them to measure and subsequently set the focus position of your scope at the start of the night. Optical aberrations such as coma can cause elongated stars. This is easy to diagnose as aberrations cause elongation in different directions across the image (typically pointing outwards from the centre towards the corners), whereas guiding issues will cause trailing or elongation in the same direction for all stars in the image. – Environmental causes, typically you, dear reader. You need to do your best to isolate your mount from external sources of vibration. A solid tripod or pier, anti-vibration pads, etc. The list of cures for vibration is endless and I’ll leave you to do your research on that one. If your imaging software allows it, program in a pause before the first image is taken. Use that time to walk away from your scope since your size tens are more likely than not to be a source of problems even on a solid concrete pad. – Camera-induced vibration is typically a problem for DSLR imagers. When starting an exposure, the mirror makes a very satisfying ‘clunk’ as it flips up out of the way before the shutter opens. That tends to induce plenty of vibration in the imaging rig. Most astro-DLSR applications have the ability to program a pause between the mirror lock-up and opening the shutter. I recommend setting this pause to at least five or ten seconds to allow vibration to die down. Wind is also a big issue. If you find you are getting erratic guiding or stars that look like they have been drawn with a spirograph (wiggly lines all over the place), it may well be that the wind is causing your scope to wave around like a windsock. Bigger the scopes like Newtonians have more surface area and can suffer from this problem more. Look for a sheltered spot or wait for better weather. Poor Seeing is also a problem. There are techniques that can help with this (see below) but you will find that the quality of your guiding definitely varies according to the seeing conditions. If you get it right, you’ll end up with bigger (but still round) stars on nights of poor seeing, but if you get it wrong you can end up with trailing or wiggly lines as above. ST4 Cable or ASCOM Pulse Guiding? As you may be aware, there are two typical methods of sending guide corrections to the mount. Some cameras may be connected directly to the mount by means of an ST4 cable, so guiding corrections are sent by means of electronic signals to the mount controller board. Alternatively, guide corrections may be sent through software via the mount driver (typically the ASCOM platform and drivers on a Windows PC). Which is ‘better’? The reality is that neither method is intrinsically better than the other. There is no performance advantage in using an ST4 cable over using ASCOM pulse guiding, as the time taken for corrections to reach the mount is minuscule compared to the duration of even a 1 second guiding exposure. If you are using an auto guider which calculates its own guiding corrections on the camera, then using ST4 may make things simpler as you can do away with one set of drivers on the laptop (or not use a laptop at all if capturing images directly on a DSLR memory card). We are talking about PHD guiding here though, so I’ll assume that isn’t the case. – If you wish to use an ST4 cable with PHD guiding, you should select ‘On Camera’ from the PHD ‘Mount’ menu to tell it to send guide commands via the camera’s ST4 port. – If you wish to use ASCOM pulse guiding you would select ‘ASCOM’ from the mount menu, and choose the appropriate mount from the dialog when you press the ‘connect to mount’ icon on the PHD tool bar. – For non-ASCOM mounts supported by PHD, you’d choose the appropriate mount from the menu instead. To PEC or not to PEC? Periodic Error Correction (PEC) is a feature of some mounts and/or their drivers. All mounts will suffer from Periodic Errors in tracking in the RA axis, which relate to the rotation of the RA gears (gear periods, hence the name). As the gears rotate, machining imperfections in the gears cause the tracking to drift East and West of the correct position in a repeating cycle. The PE of a high end mount might be a few arcseconds, but on a low end mount (sub £2,000) a PE of 10 arcseconds is considered ‘good’, and figures much higher than that are not uncommon. PEC records those errors by monitoring guiding corrections for at least one full cycle of RA worm gear. Subsequently the mount (or driver) plays back those errors to correct the tracking before it drifts off target. When used properly, PEC should be superior to guiding alone since it prevents most of the tracking errors before they happen, not after they are detected. Whether you should use both PEC and guiding together is an ecumenical question! If used properly, then PEC should give superior performance to guiding alone, but I am definitely in the camp that thinks it is rather a lot for a beginner to take in conjunction with learning the ropes of guiding. If you are using an HEQ5, NEQ6 or related mount with the EQMOD drivers on your laptop and you also want to use EQMOD’s PEC features, you should definitely use ASCOM pulse guiding. The drivers have been written to properly combine the PEC corrections with pulse guide commands from PHD (or any other software that produces pulse guide commands). This avoids conflicts between PEC and PHD which could otherwise over or under-correct guide errors, whereas using an ST4 cable with EQMOD PEC may result in such problems. (Thanks to Chris Shillito, EQMOD guru and all-round good guy, for his many patient posts on this subject which I am paraphrasing here). The next tip is to do as much testing as possible during the daytime. It is much easier to solve problems when you are warm, indoors and have plenty of time. Trying to solve problems in the dark, cold and when you feel like you are wasting precious imaging time is a recipe for silly mistakes. – Do a dry run of your entire set-up and imaging routine. Check you know where all the cables go and that they are not loose or prone to disconnection. Check that all the software can see the cameras, mount, etc. Ensure that all drivers are installed and properly configured. Last of all do a complete ‘systems check’ to ensure that everything works together. I have had many issues where individual components work fine, but fail when asked to work together, e.g. EQMOD works on its own, but not with PHD connected, or APT works but not with EQMOD, etc. – Check your guiding rig can achieve focus. You may find that you don’t have sufficient back-focus on your guide scope or finder and you need to add an extension tube. Focus on a distant object in daylight to verify this. – Note the focus position of your guide scope and your imaging scope. You can get close during the day but you will need to refine this by focusing on a star. Again I have wasted many hours struggling to get cameras focused; unlike eyepieces it can be incredibly hard to tell where the focus point is until you are almost there, and how do you even know if you have a star in frame if you are way out of focus? – Once you do have good focus on both scopes, measure the length of focus tube that is out of the focuser body. You could mark it with a pen (not good for resale value), or make a focus measure with a strip of metal or stiff plastic that just fits between the camera and the focuser body when you are in focus. You can sit it on the focuser tube and instantly get close to the focus point with no effort. – Review the software settings described in the sections below until you are familiar with them and have a reasonable idea of what they do. It can be very confusing at the outset with so many knobs and dials to fiddle with, so try to learn as much as you can during the day or when it is cloudy. Camera: Firstly connect to the camera by pressing the ‘camera’ icon on the left of the PHD tool bar. A dialog box will pop up and give you a choice of camera types to choose from. You’ll have to read the manual (or search the forums) for advice on which option is the right one for your camera as they do vary, and debugging camera drivers can take a fair bit of time when you first start out! It is worth knowing that some cameras allow you to adjust the camera gain (brightness) from within PHD using the ‘Cam Dialog’ button at the right of the PHD tool bar, but for other cameras you can only adjust the settings at the point where you first connect to it. If so, you will need to use the camera button to disconnect/reconnect the camera each time you want to make an adjustment. You will not see anything on screen when you connect to the camera. The next thing you need to do is press the ‘Loop’ button, the blue circular arrow third along on the tool bar. This will start taking repeated exposures (by default 1 second exposures). You can test whether the camera is working by covering and uncovering the scope (the PHD display should go black when covered and brighten up when uncovered). If you see nothing, then it is time to check your drivers, adjust dialog settings to increase/decrease gain, etc. Mount: Next you should test your mount connection. Make sure you select the appropriate mount from the PHD ‘Mount’ menu and then click the ‘Telescope’ icon second from left on the tool bar. You may be presented with a dialog to choose the mount driver depending on the model; again check the forum for advice on your specific mount. Test Guiding: The final check (for now) is to ensure that your guide commands are making it through to the mount. Once you have successfully connected to the mount, you should set it to sidereal tracking rate (using EQMOD, the mount handset or whatever method is appropriate to your mount). Listen carefully to the mount and you will probably be able to hear the mount motors driving the mount as it tracks (it may be a very quiet singing/whistling sound for example). You won’t see the mount visibly moving though, as it will take 24 hours to rotate 360 degrees in RA. Next go to the PHD ‘Tools’ menu and select ‘Manual Guide’. You will see four buttons to send short guide commands in North, South, East and West Directions. Start by repeatedly clicking the ‘West’ button and listening carefully to the tracking mount. You should hear the motor sounds change slightly as you click, which indicates that the guide command was received and acted upon. Next try the ‘East’ button. In this case you may hear the motor sounds change or more likely stop momentarily. Finally try the ‘North’ and ‘South’ buttons and you should hear the Dec motor starting up and stopping. Bear in mind these sound are quite subtle and you may not be able to detect them. If you can point the main scope at a distant object and use a high-power eyepiece, you can visually check whether the mount is moving when you click the manual guide buttons. If not, you will have to wait until you can get it out under the stars, but it is better for your sanity if you can confirm that PHD is in control of your mount during the hours of daylight. 1. Whilst some new mounts and/or software can get your scope’s GOTO aligned however bad your polar alignment, most mounts still rely on a reasonable polar alignment to get the process started. If you can’t get your scope’s alignment routine going, you aren’t going to be imaging very much. 2. Both equatorial mounts and fork mounts on wedges rely on polar alignment to track the sky properly. If you have a poor polar alignment, your exposures may well suffer from field rotation. Basically the stars will not stay as pinpoints but will form short curved arcs instead. This is more likely the longer the exposure length and/or the longer the focal length of your imaging scope. With a short focal length scope for (say) ten minute exposures, a polar alignment done with just the polar scope will be fine. If you’re imaging with a long focal length scope and going for hour-long exposures, then you may well need to drift align to avoid field rotation. It is worth noting that using a guide scope that is not aligned with the imaging scope can also cause field rotation, but the same caveats apply, i.e. for a short focal length/short exposure don’t worry about it too much. – All mounts track by means of motors which drive a system of gears; one motor and set of gears for the RA axis to track in the East-West direction, and one motor and set of gears for the Dec axis to track in the North-South direction. In a mass-produced mount, those gears are manufactured to a price; they are not hand-crafted things of beauty and they will have various imperfections that cause tracking errors. – In even the most perfectly made set of gears, there is an amount of ‘backlash’. Put simply, there has to be a gap between the gears; if they fitted together perfectly then the gears would be unable to turn at all. That gap causes problems when the gears reverse direction, since the gear has to turn a certain amount to stop pressing on one side of the teeth and start pressing on the other, so there is a delay before the gears start moving the opposite way. A high-end set of gears will have a small amount of backlash, but guess what? We’re not dealing with a high-end set of gears and there can be a lot of backlash in a typical low-end mount, especially if it wasn’t well adjusted at the factory. – Backlash should not be a problem for tracking in RA. When tracking, the mount should always be driving the scope from East to West and will not reverse. There may be a small amount of backlash at the start of tracking if the mount’s last GOTO was from West to East, but this is quickly taken up. PHD guiding will speed up the RA motor if it needs to move West to correct a guide error. It will stop the RA motor if it needs to correct to the East, and wait for the sky to ‘catch up’. In other words once tracking has started, the RA gears will never reverse and enter into backlash. – The same cannot be said of the Dec axis. In this case, if PHD needs to guide North, it drives the Dec motor North, and if it needs to guide South it drives the motor the opposite way. If your set-up constantly requires PHD to keep guiding in opposite directions in Dec, the gears will spend a lot of time in backlash, which delays the guiding corrections from taking effect and may cause PHD to over or under-correct the error. The ideal situation is that all Dec guiding corrections be made in one direction only (North or South, it matters not) so that the gears stay out of backlash. PHD will do its best to make that happen (unless you tell it not to), but there are things you can do to assist it. The next tip is not to sweat too much over drift alignment. If you have been imaging using an unguided mount, you may well have put a lot of effort in to drift aligning the mount to maximise exposure time. Contrary to your expectations, when guiding a small amount of polar misalignment is not a major problem when guiding a short focal-length imaging scope..
– You don’t want such a misalignment as to cause visible field rotation during your exposures. – Nor do you want so much misalignment that you cause PHD’s calibration routine to fail (see below). If you have severe drift in Dec, PHD may interpret the drift as resulting from its calibration commands and will end up under-correcting when guiding in Dec.
As stated previously, I find that a polar scope alignment works really well for my short-focal length imaging, but the longer your focal length, the more critical a good Polar Alignment becomes, and thus part of the reason why imaging at long focal lengths is hard. If you do have perfect polar alignment (i.e. you are drifting so little it produces no visible effect on the image during one exposure), you can switch off Dec guiding altogether. Click on the ‘Brain’ icon on the PHD tool bar and set ‘Dec Guide Mode’ to ‘Off’. This might be the case if you have a permanent observatory with a pier and a rock-solid mount adjustment. For the rest of us, it is probably quicker to leave ‘Dec Guide Mode’ on ‘Auto’. and let PHD work out what to do for the best. The next tip, if using an equatorial mount, is to think about Balancing it, or should I say not balancing it! The mount manual will probably explain that it is important to check the balance of the mount, so that the RA and Dec axes will stay in a horizontal position when the clutches are unlocked. It is certainly true that you do not want a massive imbalance in either axis, especially if using heavy equipment, as this will put a lot of strain on the gears and motors and may lead to premature wear. – The usual advice is that the mount should be “East-side heavy”, so that it is working to lift whatever is on the east side of the mount. So if the scope is on the East side of the mount (pointing West of the meridian) then you should move the counterweights up the counterweight shaft slightly higher than the perfect balance point. Conversely, when the counterweights are on the East side of the mount (scope pointing East of the meridian), move them down the shaft below the perfect balance point. You are aiming to have the RA worm (one of the gears) drive the main RA worm gear. By keeping the RA axis imbalanced to the East, you force the gears to stay in contact with each other (‘driven’ imbalance). This tends to smooth out any sudden movements more than the opposite (‘resistive’) imbalance. In the resistive set-up, the worm gear may slip or jolt suddenly due to uneven machining. This can also happen with driven imbalance, but most people report better results with driven imbalance than resistive imbalance. My personal experience with my NEQ6 is that so long as I have some imbalance in RA, it doesn’t particularly matter which side is heavy. In fact when I am within 30 minutes of having to do a meridian flip, I will often pre-emptively do a ‘forced flip’ between exposures (so I can get back to a frosty beverage of my choice and watching the TV on the nice warm sofa). The scope ends up on the ‘wrong’ side of the mount (East Side pointing East) with the counterweights higher than the scope until it tracks through the meridian. I’d expect at least one bad exposure as the weights drop through horizontal and the gears switch from one face to the other, but it never happens. Again I suspect that using a short focal length imaging scope gives me a lot of room for manoeuvre! – The same sorts of consideration apply to the Dec worm and worm gear (unless you are not guiding in Dec of course). You need to imbalance the Dec axis by moving the scope forwards/backwards (or adding weights) depending on which direction you are pointing relative to the zenith so that you achieve driven resistance. – If the scope is pointing South of the zenith, imbalance the scope so that the North (lower) end is heavy. – If pointing North of the Zenith, again imbalance so that the North (higher) end is heavy. – Pointing South of zenith, South/higher end heavy. – Pointing North of zenith, South/lower end heavy. We looked at a few of the basic PHD settings during testing above, so hopefully you already know how to get your camera and mount connected to PHD ready to start guiding. Next we will look at a few of the more important settings. – You need a long enough exposure to produce a measurable guide star. If your exposure length is too short (and/or your camera gain too low), you will either get no stars or stars that are too faint to use reliably. If you find you are able to lock on to a star and calibrate, but then get frequent ‘Star Lost’ errors flashing up, it may be that your chosen star is too faint. Increase the exposure length (and/or gain). – You need a short enough exposure not to saturate the guide star. If your exposure length is too long (and/or your camera gain is too high) you may get a ‘Star Saturated’ error from PHD. This means that one or more of the star’s pixels has reached maximum brightness and PHD cannot calculate the star’s centroid accurately. Reduce the exposure time and/or reduce the gain. – You need an exposure length that is short enough that PHD can detect and correct guiding errors before they become visible on your main image. In an ideal world we’d take guide exposures as frequently as possible, but in practice there is a minimum length of exposure dictated by the need to pick up a guide star (see above). Furthermore it can be advantageous to have a longer exposure to reduce the effect of seeing. Really short exposures can end up with PHD “chasing the seeing” and poor guiding, whereas a slightly longer exposure averages out the seeing and gives a better estimate of the guide star’s centroid. – When you have selected a guide star, the star’s ‘Signal to Noise Ratio’ is displayed at the bottom left of the PHD window on the status bar. There is no hard and fast rule as to what this number should be. Generally speaking a higher number is always better, provided you are not getting ‘Star Saturated’ errors from PHD. Use the SN number to tweak your exposure length, camera gain and focus until you get a reliable lock with no ‘Star Lost’ or ‘Star Saturated’ errors. If you are really struggling to get an acceptable SN number with your camera, you can go in to the ‘Brain’ icon on the tool bar and change the ‘Noise Reduction’ setting from ‘none’ to ‘2×2’ or ‘3×3’. This increases SN by ‘binning’ pixels in software at the cost of reduced guiding accuracy. If trying the 2×2 setting, multiply the camera pixel size by 2 (or by 3 if using 3×3 setting) and calculate the guider pixel scale using the equation we discussed above. If you are still within the 4x pixel scale rule of thumb, you will probably be OK.
– The best advice I can give you for exposure length is to start with a two or three second exposure and work from there by reference to the guiding graph, which we’ll look at below. Over a few sessions you’ll get the hang of the right exposure length for your equipment. – Bear in mind my earlier comments that if you are pushing the envelope and imaging at a long focal length, you may need a more sensitive guide camera, a longer focal length and/or faster f-ratio guide scope (hard to do both), to use PEC in addition to guiding or simply a higher quality mount. The next tip is that it might help defocus the guide scope slightly. If you are having problems with saturated stars, or you are exceeding the 4x pixel scale rule, this may help. Defocusing will spread the light of the star over more camera pixels which can prevent saturation, and also makes it easier for PHD to detect the centroid of the guide star more accurately. Don’t go mad with defocusing or PHD won’t be able to lock onto the star and you may start getting ‘Star Lost’ errors if your SN figure drops too much due to de-focusing. In all cases your guide star still needs to have a brighter central peak and not turn into a hollow doughnut, but a bit of defocus on the guide scope may help where you have SN to spare. You can use the ‘Star Profile’ option on the ‘Tools’ menu to check the profile of your guide star once selected. It should have a peak in the middle like a mountain. If it is flat on top you have a saturated star, and if there is a dip you need to focus more. – Firstly you may end up selecting a hot pixel as your guide star. Normally PHD will spot this and complain, but you may waste a lot of time trying to calibrate on it if it doesn’t (or even guide on it if retaining an existing calibration). The guiding graph looks great since the hot pixel stays dead centre of the lock box, but the final images do not! – Secondly as you guide, a hot pixel may be close to the guide star, and PHD may intermittently include the hot pixel as part of the star image causing the centroid position to jump around erroneously. Bear in mind that whenever you change exposure length or camera settings, you should re-take your dark using this button. – Click the ‘Loop’ button to start taking guide exposures. Hopefully you will see a choice of guide stars in the PHD screen. If you don’t go back a few steps and adjust the exposure/camera gain and try again (re-taking your dark if needed). – Click on the brightest star but avoid using a star that is close to the edge of the image, as it may drift out of view over the course of the imaging session (especially if you are dithering your images). Check that PHD is not complaining about the star being saturated, and ensure that PHD has found the star (it should draw a green box around it if it is happy). – Avoid picking a star that is close to another star, and also avoid using any known double stars. In both cases you may end up with erroneous/fluctuating centroid calculations and spurious guide commands. – Next click on the ‘PHD’ button and PHD will start the calibration process. It will attempt to move the star some distance East and West in RA, and then North and South in Dec in order to figure out which guide commands move in which orientations and also how long guide pulses need to be..
A pair of lines will be drawn in a cross indicating the initial position of the guide star, and you will see the status bar indicating which guiding commands are being sent. All being well you will see the star and the green box gradually drift along one of the lines, stop and drift back again, and then do the same along the other line. This process can take several minutes to complete successfully so be patient. A good calibration will usually require somewhere between seven and forty steps in each direction. If the calibration completes in less than seven steps in any direction, you are unlikely to get good guiding performance and you should change the calibration step size (see below). If the calibration takes more than forty steps in any given direction it will still work, but again you may want to change the calibration step size to save time. My experience is that a good calibration takes about 15-20 steps and between five and ten minutes to complete. If the calibration fails with PHD complaining that the star didn’t move enough, then you have one of two problems. Either the calibration step size is too small (see below), or your guide commands on one or both axes are not being acted upon. We talked about using the ‘Manual Guiding’ option on the ‘Tools’ menu to verify that PHD can control the mount, so if you haven’t done so already, put a high-powered eyepiece in your imaging scope, centre a star and then use those controls to make sure the scope moves in all four directions when commanded. The final thing to be aware of is that you should recalibrate PHD whenever you slew to a new imaging target (unless it is within a few degrees of your original target). You do this by clicking the ‘Brain’ button on the tool bar and ticking the ‘force calibration’ button. You will not be able to successfully guide if you try to keep the same calibration in different parts of the sky. Similarly if you perform a meridian flip on an equatorial mount, you should probably re-calibrate. There is an option on the ‘Brain’ dialog to reverse the existing calibration after a flip, but my experience is that it is better to spend five or ten minutes recalibrating rather than spending ten minutes exposing only to discover you have to recalibrate anyway! If you are have a good guide star (good SN figure, not saturated), and PHD is definitely able to command the mount but calibration fails, then it is a fair bet that the Calibration Step Size number needs to be adjusted. Click on the ‘Brain’ icon on the tool bar to bring up the advanced PHD settings. – The bigger the pixel scale of your guiding rig, the longer the step size should be. I use 2,000 to 2,500ms for my 400mm/5.6µm guide scope at 2.67 arc-second per pixel. If your pixel scale is a bigger number, increase the step size, if smaller decrease it. – The closer you are to the celestial pole, the longer the step size should be. Typically I use 2,000ms near the celestial equator and increase that to 2,500ms as I approach the pole. The appropriate range will vary according to the pixel scale of your guiding rig. – Your mount, or mount driver may allow you to set a custom guiding rate. The best starting point is to set your guiding rate to 1x, which means that when guiding East the mount will stop completely, and when guiding West it will move at 2x sidereal rate. Many mounts offer 0.5x guiding rates (and others), which are helpful when hand guiding, but probably not that much use when using PHD. keep it simple and use the 1x guide rate. The next tip is that you should experiment with the calibration step size and keep notes of what works for each declination. Provided you are calibrating in more than seven steps you should be OK, but if you are exceeding 40 steps you can almost certainly save time by increasing step size. I aim for 10-20 steps at most. Once PHD completes calibration, it will immediately start guiding. The pair of lines will turn green and guide commands will be sent. Time to start imaging at last. I know it has taken a long time to read to this point, but in reality and with a bit of practice, the time from finishing centring and focussing my imaging target in the main scope to having PHD guiding merrily away takes me seven minutes on average, and for about 6 minutes and 30 seconds of that time, PHD is calibrating without any input from me! As far as guiding goes, the next thing you need to do is monitor the PHD status bar for a minute or two to make sure you are not getting ‘Star Lost’ or ‘Star Saturated’ errors. The occasional ‘Star Lost’ error is nothing to fret about usually, but if they are flashing up repeatedly you should do some troubleshooting (check exposure and gain as described above, look out for high cloud and dewing on the guide-scope). The most useful tool for checking your guiding performance in the field is the guiding graph. Go to the ‘Tools’ menu and select ‘Enable Graph’. What you will see is a graph showing your guiding performance in RA (the blue line) and in Dec (the Red line). The name of the game is to try to keep the two lines as close as possible to the centre line running from left to right across the chart. The horizontal scale button (‘100’ above) allows you to zoom in and out by reference to guiding cycles. By default 100 guiding cycles are shown across the chart, this isn’t a fixed time scale as such and the longer your individual guide exposures, the longer those 100 cycles will take. You can click the scale button to zoom out and see more cycles, but to be honest the default 100 cycles is most useful for diagnosing guider problems. The vertical scale button (RA/Dec) allows you to switch between RA/Dec corrections and x/y pixel corrections. Again the first mode is most useful since you want to see what is going on with your RA guiding and Dec guiding separately, whereas the x/y mode isn’t (necessarily) much help in that regard. 2.67 arcseconds per pixel x 0.2 divisions = 0.53 arcseconds. This is what we call the “Root Mean Square” or RMS error, which basically means we square the all the errors (positive stay positive, negative x negative becomes positive), add them together, average the total and take the square root. If we didn’t calculate the RMS then the negative errors (below the line) would cancel out the positive errors (above the line) and our average error would be close to zero, which clearly it is not! – If you have a small RMS figure and a large OSC index you should be okay. The mount is constantly flipping between guide directions but only by a small amount. – If you have a large RMS figure and a large OSC index, that would tend to suggest the poor guiding is due to lack of stability in the set-up, and that could be down to mechanical/balance problems, wrong exposure/gain on the camera creating a noisy guide star, incorrect guiding parameters or just really bad seeing conditions. Unhelpfully in my example, the OSC index is greater than 0.5, which suggests the mount is correcting more in RA in one direction than the other over time. I’m man enough to admit I don’t know what that means! What I do know is that I got really good imaging results from that session so clearly it wasn’t a problem to worry about. – First of all, please bear in mind that you can have a pretty ugly looking guiding graph that produces little or no visible effect on the actual image. The opposite is also true of course! You need to convert the pixel lines on the vertical scale and/or the RMS error to arcseconds of error by performing the guider pixel scale multiplication described above. Now compare that to the pixel scale of your imaging rig. You may find that what looks like a major guiding issue is actually less than a pixel or two of error on your final image. Looking at my graph, I can see that the RA error is roughly evenly distributed above and below the line so I should double the RMS error, meaning my stars are perhaps half a pixel wider than they should be in RA. The Dec error looks pretty much the same. Sounds pretty good to me, and indeed it looks good on the final result. (If the guide error was predominantly above the line, or predominantly below the line, we could use the smaller 0.28 pixel RMS value instead). – If one or other of the RA/Dec lines is shooting off the graph it may mean that corrections in that axis are not being sent to the mount or are not being responded to. Again perform the manual guiding checks to ensure everything is working as you would expect. Also check that you haven’t turned off Dec guiding under the ‘Brain’ button. If everything checks out, ensure your clutches are tight on the mount and look for other signs of flexure or equipment flapping about. The next tip is that your results may well vary according to the Alt and Az of the target. I consistently get better results on higher targets nearer to the meridian. Targets lower in the east produce rougher guide graphs. Whether that is due to poor seeing due to more atmosphere in the way of the guide star, something mechanical or perhaps needing to tweak the guiding parameters I know not. – RA Aggressiveness: How much of the calculated RA correction to apply. Start with the default figure of 100%, as hopefully PHD knows what it is doing. If you find that guiding in RA (blue line) is constantly overshooting the mark and then rapidly zig-zagging back the other way, try reducing this to a lower figure, perhaps 70-80%. If you think your mount has sloppy gears, maybe try going to 110 or 120% to see if you can compensate. – RA Hysteresis: How much of the previous RA guiding trend to take into account. Good guiding is smooth and doesn’t respond to rapid changes in guide direction (usually caused by seeing or poor SN from the guide star). If you think that guiding is too jerky with sudden rapid corrections, increase this number, or decrease it to make guiding more responsive. Aggressiveness and Hysteresis go hand in hand and you should normally reduce or increase them together in small increments until you get best results. – Min Motion: The smallest guide error that should result in a correction being made. This is in pixels and applies to both the RA and Dec axes. So if I set min motion to 0.1 pixels, then PHD would not try to correct any errors until they were more than that value, and for my guider scale of 2.67 arcseconds per pixel, that means PHD would not try to correct any errors less than about a quarter of an arcsecond in size. Again this is useful for smoothing out jerky guiding if your mount is poor or you don’t have a good guider set-up. – Max Dec Duration: This is the same as above. The default setting is smaller than the default for RA out of the box, and I’ve never needed to change it. To be honest I think that is the final tip: If it ain’t broke, don’t fix it! It can be very tempting to dive in and start fiddling with the advanced parameters in PHD in the hope of finding a magic formula for pixel perfect guiding. In reality 90% of the guiding problems are external to PHD guiding. Only when you have investigated and fully understood all those externalities will you be able to make an informed decision as to what to tweak in PHD itself. There are many other resources on-line covering advanced PHD fettling, and plenty of people on the Stargazer’s Lounge forum willing to offer you customised advice and assistance, so please don’t hesitate to ask for help. You’ll probably find their advice more useful if you have done a bit of homework first.